Look just like Kate for Less! 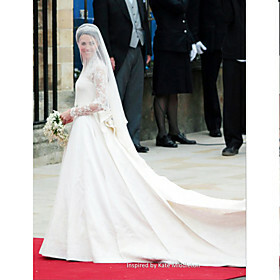 Looking for a look-a-like Kate Middleton wedding dress, a replica of the fabulous Alexander McQueen dress designed by Sarah Burton at the 2011 wedding of the year? Our trusted wholesale wedding dress partner has made an amazing replica with intricate detail on their version of the Royal Wedding dress and it can be yours for less than $500. The lace details on Kate's dress included roses, daffodils and thistles and was painstakingly crafted at the Royal School of Needlework in Hampton Court. You can be sure that this kind of detail is also captured in the lace embroidery on the dress below. Look and feel like a princess in this fabulous A-line wedding gown with dropped waist and v-neck. With gorgeous lace embellishment and long sleeves, this regal dress is fully lined and has a built-in bra. Every dress is specially made to order and while originally sold out, is now back in stock. But hurry! While every bride would love to choose from a range of designer wedding gowns and walk down the aisle in a fairytale gown similar to the Kate Middleton wedding dress, most people don't have that kind of budget. Which is why I love being able to share designer look-a-like wedding gowns with you. So why not look like a princess yourself, at a fraction of the price? Remember: You can buy your own Royal Wedding dress, just like the Kate Middelton wedding dress for just $499.99 by buying direct from the wholesale manufacturer - just click on the More Info/Buy button above. Tip: See more fantastic low price celebrity wedding dresses here including the dress worn by Anne Hathaway in the Princess Diaries film - a dress with similar lace detail more suitable for a hot summer wedding.